Cannabis has been well known to treat eye pressure associated with glaucoma. Now recent research indicates that direct topical application of cannabidiol (CBD) may be beneficial for neuropathic ocular pain. Pain perception is a critical self-defense mechanism for the body. Pain tells us to steer clear of adverse stimuli—think of a hand over a flame. Ocular pain, a source of acute discomfort, may be a signal that prevents damage to the eye (from exposure to a noxious chemical or a mechanical probe, for example). The cornea, the transparent lid over the iris, has one of the highest concentrations of sensory nerve endings in the body, which makes it extremely sensitive to touch, temperature and chemicals. Contact with the cornea triggers an involuntary reflex that closes the eyelid. Injury to the cornea is often associated with hyperalgesia and corneal neuropathic pain (CNP). Hyperalgesia refers to a heightened sensitivity to pain, usually due to damaged nerve terminals and pain receptors. The Dalhousie experiments were conducted on animals, reproducing corneal neuropathic pain by cauterization (burning) and by application of chili pepper (capsaicin) onto the surface of the eyeball. The researchers showed that all the animals receiving CBD via topical application significantly reduced their pain as measured by the decreased rate of eye blinking. The probability of this being a random result was deemed to be less than 0.0001, which is the closest science gets to certainty. The scientists from Nova Scotia went further and repeated the same experimental model involving painful chili sprayed on the eyes of mice. But the second round of tests utilized mice that had been genetically modified so that they lacked CB2 receptors. Cannabidiol and the synthetic CBD derivatives were administered to the genetically modified mice without CB2 receptors to see how they responded to induced cornel pain. 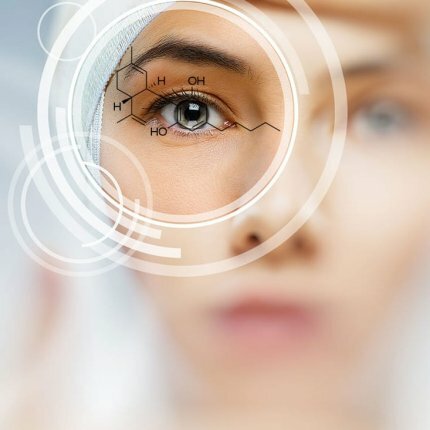 The results were different from the first test in two key ways: 1) CBD had an analgesic effect on the eyes of the CB2-deleted animals, but CBD’s painkilling effect wasn’t as pronounced as it was with the first group of mice that responded favorably to CBD treatment for induced corneal pain; and 2) the synthetic CBD derivatives failed to elicit any painkilling response in the genetically modified mice. Based on these results, the scientists concluded that CBD and, to a lesser extent, its synthetic derivatives can reduce pain at the cornea by activating CB2 receptors. They also determined that the analgesic effects of CBD are mediated only in part by CB2 receptors, and that other receptors (or receptor-independent pathways) must also be involved in mediating the notable painkilling properties of CBD. The use of natural or synthetic cannabinoid extracts is challenging for topical application due their highly lipophilic profile, which makes it difficult to dissolve cannabis oil formulations in water. Oil and water simply don’t mix well. This problem is particularly relevant with respect to cannabinoid-infused eye drop solutions, which must penetrate the watery, tear layer over the cornea in order to function at the eye. Since the mid-1970s, smoked THC-rich cannabis has proven beneficial for lowering intraocular pressure and relieving symptoms of glaucoma. But the development of cannabinoid-infused eye drops would stall because of the lipid factor. More recently, different micro-emulsions and cyclodextrins (cyclic sugar molecules) have been shown to enhance the corneal penetration of endogenous cannabinoids. These formulations were tested for their ability to lower intraocular pressure—with successful results.9 Perhaps a similar solution could be utilized to deliver CBD and other plant cannabinoids as a treatment for corneal neuropathic pain. Given the efficacy of cannabidiol in preclinical research, as well as its stellar safety profile, it would behoove medical researchers to pursue additional studies on CBD eye drops for glaucoma patients. Moreover, this effort should be expanded to include whole plant extracts with THC, as well as CBD. Hopefully, cannabis-infused eye drops will soon be available for those who wish to avail themselves of the benefits of a novel form of medical marijuana. Viola Brugnatelli is the founder and director of the scientific online magazine Nature Going Smart. 1 Mao, J., Price, D.D., Lu, J., Keniston, L., Mayer, D.J. (2000) Two distinctive antinociceptive systems in rats with pathological pain. Neurosci. Lett., 280, 13-16. 2 Selph, S Carson, S Fu, R et al. (2011). Drug Class Review Neuropathic Pain. PDF of Study. Last accessed 4/3/13. 6 Toguri, J.T. Thapa, D. Laprairie, R. et al. (2016). Efficacy of cannabidiol and cannabidiol derivatives in the treatment of ocular pain. International Cannabinoid Research Society 26th annual symposium. 26 (1), 24. 7 Green K, Roth M. Ocular effects of topical administration of delta 9-tetrahydrocannabinol in man. Arch Ophthalmol. (1982) Feb; 100(2):265-7. 8 Jay WM, Green K. Multiple-drop study of topically applied 1% delta 9-tetrahydrocannabinol in human eyes. Arch Ophthalmol. (1983) Apr; 101(4):591-3. 9 Jarho P, Urtti A, Pate DW, et al. Increase in aqueous solubility, stability and in vivo corneal permeability of anandamide by hydroxypropyl-β-cyclodextrin. Int J Pharm (1996);137:209–17.